On this date in 1330, the king’s half-brother Edmund of Woodstock lost his head for treason. Edmund was the youngest son of Edward I. That patrimony didn’t come with a throne attached, but hey, you could do a lot worse than Earl of Kent. You could do a lot better too, though, if you had royal blood. According to the chronicle Vita Edwardi Secundi, Edmund (or possibly the middle brother Thomas) was intended by his father for the more august and lucrative earldom of Cornwall. * But Edward I died when Edmund and Thomas were young boys, and “his sad death prevented what would have been appropriate from being consummated.” Instead, the heir-turned-king Edward II stiffed flesh and blood to hand Cornwall to his notorious favorite, Piers Gaveston. Edmund seemed to get over the slight and generally had the king’s back during the turbulent 1320s. However, after fighting for his brother’s interests in France, he found himself there in Paris in 1325-26 with Edward’s French Queen Isabella and her lover Roger Mortimer just as that couple set about plotting their rebellion. Edmund joined their circle, took part in their invasion of England, and sat on the tribunal that condemned the deposed king’s new notorious favorite, Hugh Despenser, to death. As the price for his support, Isabella and Mortimer fulfilled the cash pledges Edward I had long ago made to the boy. His attitudes and allegiances appear ambiguous during the unsteady years of Isabella and Mortimer. Whatever his acquiescence — whatever his payoff — he had little real affection for the new master and mistress of the realm. Edmund’s end in 1330 touches a sensitive historical controversy. Worships and reverence, with a brother’s liegeance and subjection. Sir knight, worshipful and dear brother, if you please, I pray heartily that you are of good comfort, for I shall ordain for you, that you shall soon come out of prison, and be delivered of that disease in which you find yourself. Your lordship should know that I have the assent of almost all the great lords of England, with all their apparel, that is to say with armour, and with treasure without limit, in order to maintain and help you in your quarrel so you shall be king again as you were before, and that they all – prelates, earls and barons – have sworn to me upon a book. What’s really queer about this isn’t so much the volte-face on whether Edward ought to rule: it was the fact that Kent had actually attended Edward II’s funeral in 1327. Later that same year of 1330, Edmund’s 17-year-old nephew Edward III — in whose name the usurpers Isabella and Mortimer ruled — mounted a palace coup to take his reign into his own hands. With that turn of fortune, Mortimer found himself in the executioner’s clutches, and Edmund was posthumously rehabilitated. Edmund’s daughter Princess Joan — the “Fair Maid of Kent”, and in Froissart’s estimation, “the most beautiful woman in all the realm of England, and the most loving” — married Hundred Years War hero Edward, the Black Prince. Among the children Joan bore Edward was the eventual King Richard II. * Infinitely more lucrative: the Earldom of Kent was a newly re-created title that had last been used 50 years before. It came initially with no estates or income at all. I seal, I cancel, I do what I will. And, when I frown, make all the court look pale. On this date in 1330, Roger Mortimer’s three-year run as de facto ruler of England ended with a rope at Tyburn. Mortimer was a key figure in the Despenser War — a revolt of nobles against King Edward II and the king’s hated-by-nobles right hand Hugh Despenser. That war failed and landed Mortimer in the Tower. Then, things really got interesting. Mortimer escaped his cell in 1323 and fled to France. There he took up with King Edward’s own wife, Queen Isabella, when the latter came to court on some state business. This was, needless to say, quite a scandalous arrangement — but hey, Isabella had seen royal cuckolding right in her own family before. So the adulterous lovebirds settled in to canoodle and set about planning some serious homewrecking. Both Isabella and Mortimer are by every appearance among the most outstanding personalities of their day, and they had ambition to match their considerable personal gifts. In the autumn of 1326, they invaded England and won a swift victory as those disaffected nobles from the recent wars declared for the usurpers. This time, Hugh Despenser was put to death. Edward didn’t fare that much better. By the next January, he had been forced to abdicate in favor of his 14-year-old son, which in reality meant ceding power to his ex and her lover. And you thought your divorce settlement was bad. More than that, since he and Isabella ruled in the minority of the titular king, Edward III, they were rearing a wolf to their own destruction — a wolf with a built-in personal grudge about his father’s overthrow and murder. All young Edward needed was a plan to disencumber his fangs. But Mortimer got as much mercy as he’d given the late Edward II. A mere six weeks removed from mastery of England, Mortimer was presented bound and gagged for the formality of a condemnation by Parliament on grounds of assuming royal authority. Then he was hustled off to Tyburn dressed pointedly in the same black tunic he had once worn to mourn Edward II. 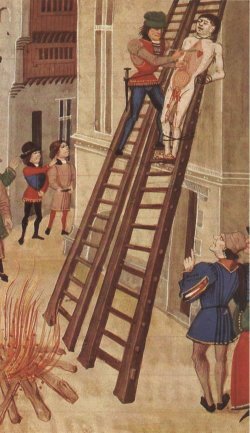 It was the first documented case of a nobleman being hanged at that grim destination. First Lord. My lord, here is the head of Mortimer. And bring my funeral robes. Thou hadst not hatch’d this monstrous treachery! The French could say the same thing of Edward.